Functional Rust: Cooking some beef! One day I’ve stumbled upon Brainfuck-like language “Cow”. And suddenly I’ve came up with an idea to write an interpreter for it in new hip language Rust. Rust is an multi-paradigm language, which means you have to chose in which style you want to write your code in. I’ve chosen functional programming. Looks a bit like Elm, Redux, and probably something else that I’m not aware of. Don’t you think so? The fact that we know from the very beginning how we going to store our data makes this task a good target for functional programming. Register - almost simple integer value, why almost? Read further! From the very beginning I’m sure that at any point of development data will be store exactly like this. No additional fields or views will appear suddenly, no “just few little changes” from client. Living the dream! Trait Copy. If you came from OOP, think of structures with this traits as of value type instead of reference type. Magical struct update syntax. It copies fields from old structure into new one. NOTE: It doesn’t actually copy fields that don’t have trait Copy (in this case Vec<i32>). It just moves them. And that’s very important, because you can stumble upon errors like this. But not in our case! We don’t care about old structure and what happens to it. Looks almost exactly like what I’ve described at concept phase, just adding few features - Debug, Default and Clone. What it is and what it does you can read in my previous article. Nothing too complicated there. Just following documentation and writing functions for every command of the language. These functions are taking and returning virtual machine, each time creating new state. All that function does - it moves index of memory array back and moves index of program array forward. Note that not all functions advance index of program array by 1, that’s why we don’t move this part to another function. It doesn’t take more space in code than calling a function anyways. Okay, let’s move to the interesting part. Remember me saying that register isn’t that simple? That’s because the best (and probably the only) way to store nullable value in Rust is Option type. It’s made in functional manner itself, by the way. Let’s not get into too much details, just note that first of all, this way is imposed by the language itself and second, it’s radically different from every language out there with nil, null or anything similar. These languages are usually called classic OOP languages: Java, C#, Python, Ruby, Go… List goes on, but it’s not the point, just get used to the new order of things. Do you see these 4 closing curly braces at the end? Terrifying. That’s why many functional languages aren’t using braces. scares me greatly. So let it be. Rest of the code we just write according to language specification. You can just look it up on github. Execute commands one by one until commands in program array end. Since we use functional way - everything has to be done recursively. So let’s do it. Simple logic - look up the new command, execute it and begin from the start. Keep doing it until nothing left to execute. That’s it. 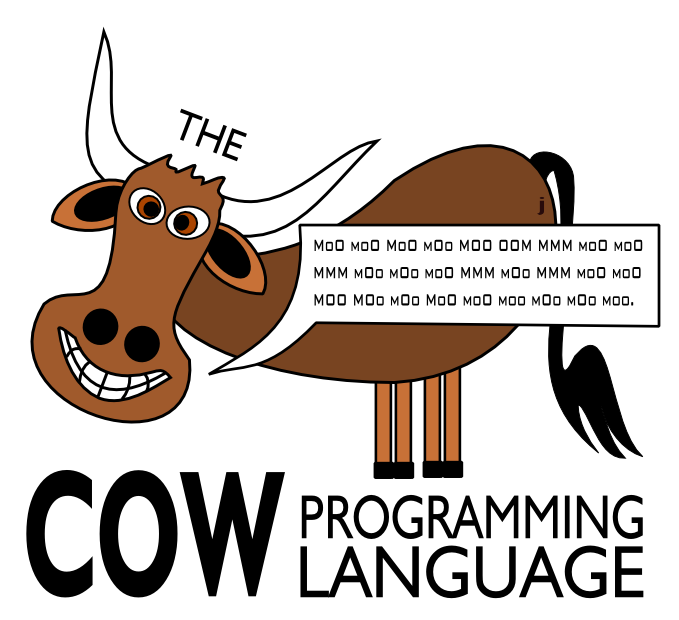 Interpreter for language COW is done! Without this feature you will quickly find out why site stackoverflow is called like that. Well, guess we will have to do cycle instead. Do you feel all the pain of the world functional programming? It’s not enough that this language made us forget our lovely recursions, it also made us use mutable variable!!! because of the reasons unknown? Actually because variable we’ve introduced in loop goes out of the scope and can’t be used afterwards. There is nothing functional about working with IO in Rust. At all. That’s why I’m not going to talk about it. You can look at the source code yourself if you find it interesting. In my personal opinion, Rust language is already becoming rusty without even being old. OOP doesn’t feel like OOP, FP doesn’t feel like FP. What we left with is “multi-paradigm”. Perhaps, exactly the mix of those paradigms will end up being cool! Let’s hope. And write in Rust. Never go OOP and never create single class. Never have problems with borrow checking. Never use references, muttable variables (almost), never hearing word “ownership” from compiler. Let me tell you, writing code knowing that it will always compile feels very good. Never touch lifetimes parameters - here, the actual dark side of Rust. Let me tell you - I’m afraid of all there (x: &'a mut i32) and I’m happy I didn’t have to do this. Never make single trait. Not really great achievement, but apparently you don’t need traits in FP all that much. Make all these functions “pure” and easy to test (maybe I will write about this, but differences in testing OOP and FP are well known and easilly googlable). Thank you all for finishing this. I welcome all of you in comment section, there we can discuss different paradigms in Rust. Any suggestions are also welcome. Thanks to @minizinger for developing especially hard for me (being non-functional) parts of the code, inspiration and general help.